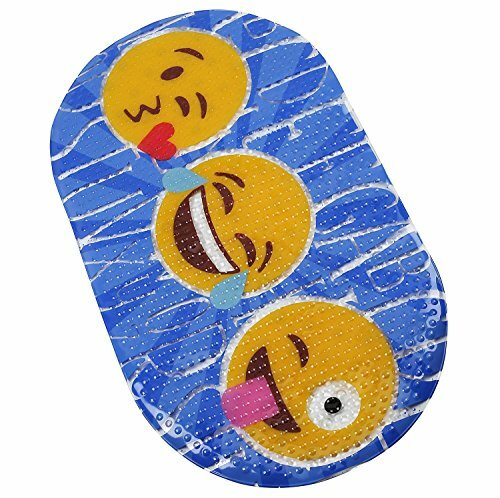 FOMI's Kids Bath Mat features a vivid and bright design of cute emojis backed by the alphabet in a fun font, making bath time more interesting and enjoyable for kids, as well as sprucing up your bathroom decor. At 27" x 15", it is suitable for standard bath tubs and showers, making it the optimal size for both babies and children. Designed with strong suction cups along the entire back of the mat that attach to a bath or shower surface, the mat stays securely in place, reducing the risk of slipping and injury. The mat is made from non-toxic, high grade PVC plastic, making it safe and resistant to tearing, as well as mold and mildew resistant. To clean, simply wash with mild detergent. The mat is then ready to be used to ensure a safe and enjoyable bath or shower experience. PREMIUM QUALITY- Made from non-toxic, high grade PVC plastic, FOMI's Kids Bath Mat is safe and resists tearing, as well as mold and mildew resistant. To clean, simply hand wash with mild detergent. SAFE ANTI-SLIP DESIGN- Strong suction cups along the entire back of the mat attach to bath or shower surface and keep the mat securely in place. Reduces risk of slipping/injury. CHILD FRIENDLY- Vivid and bright design of cute emojis backed by the alphabet in a fun font will make bath time more interesting and spruce up your bathroom decor. COMFORTABLE- The soft surface of the mat provides cushioned comfort for a baby being bathed, or a child standing while showering. PERFECT SIZE FOR BABIES AND CHILDREN- 27" x 15". Suitable for standard bath tubs and showers. Optimal size for both babies and children. If you have any questions about this product by FOMI, contact us by completing and submitting the form below. If you are looking for a specif part number, please include it with your message.